Culross Village – Have you ever arrived somewhere you didn’t intend going to and thought, “I’m so glad I brought my camera?” That’s what happened to me in 2010. That was my first thought when I found myself in this lovely village, in the Kingdom of Fife. I was supposed to be on a group woodland walking trip, (I used to go on country and woodland walks with a Renfrewshire college) and for some reason that day, the plans were changed at the last minute, so we ended up here. I can tell you though, not one of us complained. 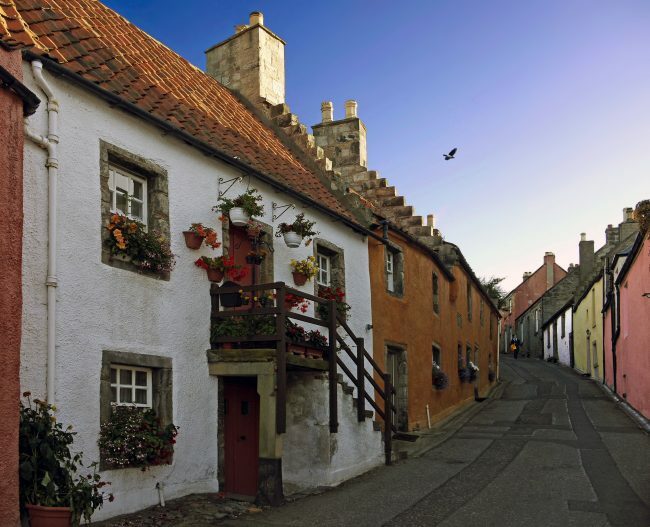 The village of Culross (pronounced Coo-Ross) is an enchanting little place that gives you the feeling of having been transported back in time. Transported back as far as the 16th century in fact. 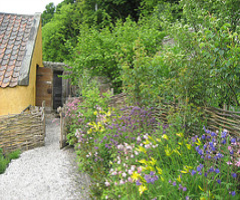 This effect is largely due to the magnificent work done by the National Trust for Scotland over the years, particularly in the painstaking restoring and caring for Culross Palace, the Town House, and the remains of old Culross Abbey. Having said that, many of the narrow cobbled streets, walls and houses are still, thankfully, in their original form, which helps add to the feel, and the authentic flavour of the place. This former Royal Burgh was once a busy seaport on the Firth of Forth, exporting salt and coal until the 18th century, and it is thought to have been the birthplace of St Mungo. A walk through the village streets will have your mind going for a wander as you try to imagine life as it might have been here around three or four hundred years ago. It’s an eerie, but pleasant feeling. As you enter Culross village, one of the first, and interesting buildings you will come to, which dates back to 1626, is the old Town House. The clock tower structure was added much later, possibly round about the early 1780s. 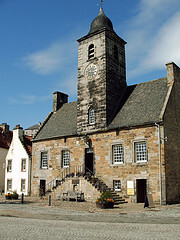 The Town House was once the home of local government and it was also used as a prison. It is believed that suspected witches were held prisoner in the attic. Talk about first impressions! You’ve only just entered the village and already you’re gripped with the history, and a sense of having a cheeky, uninvited peek at a past life, not unlike the feeling you get with a dream that you’ve just had, and you’re struggling to remember the details. Luckily, I remember the details. 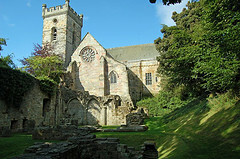 We stopped to have our packed lunch, and we couldn’t have chosen a more peaceful spot, among the fascinating ruins of the old Culross Abbey. I say fascinating, because after the steep climb leading to the Abbey you come to a display board showing the ground plans of the original building, which does not resemble what you see now. This is explained in part because the original Abbey was built in the 13th century, but was restored in the early 19th and 20th centuries, when many of the original features were removed. The Chapels were reinstated though, and they are now open to the public for worship and wedding ceremonies. One of Scotland’s greatest naval heroes, Admiral Thomas Cochrane, who was born near Hamilton, spent his childhood in Abbey House, until he joined the Royal Navy in 1793. His memorial is in the centre of Culross Village. Although we had a packed lunch, Culross has the Red Lion Inn, serving food from 12 noon til 9pm daily. I didn’t get to sample the food, but it was highly recommended by our group leader, who has. Then our wonderful tour of Culross Village continued after lunch when we moved on to see Culross Palace, which has been beautifully restored to its original distinctive yellowish colour with a red tiled roof, and shuttered windows. 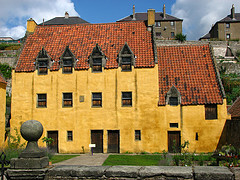 Building started on the Palace at the end of the 16th century, and was completed in 1611, for Sir George Bruce, an industrialist and Laird of Carnock, who promoted industry in the Burgh of Culross. The interior of the “Palace” has pine panelled walls, ceiling paintings of biblical scenes, and 18th century furniture. Beside the Palace you’ll find Bessie Bar Hall, which has a tearoom, should you fancy a tea or coffee, and it’s open until 5pm. Although the “Palace” was not a royal residence, it was visited by James VI in 1617. I found the ground behind the building to be much more interesting, with the model 17th century garden, which was restored by the National Trust for Scotland. The garden was more like the woodland walk that we should have been on, with its winding paths taking you through fruit trees, herbs and vegetable plots that would most probably have been found here in the 17th century. Now, I must confess….. I sampled a plum along the way, and it definitely was not past its sell-by date. Seriously though, Culross is great for a day trip. When you look to the east from the shore of the village you can see the Grangemouth Oil Refinery and Longannet Power Station, which makes you wonder if Culross had just been placed there randomly. The village of Culross is located 7 miles west of Dunfermline just off the A985, and there’s plenty of brown tourist information signs to guide you there. On arrival at the Village, you’ll find a car park just outside, with toilet facilities. Visitors with a walking disability may find access to both the Abbey and the Palace Garden difficult, as there is a steep climb. Find A Hotel In Dunfermline. A comprehensive search facility to browse hundreds of hotels and compare prices for the best deal possible. So, how much would you be prepared to pay for a house in Culross? To be honest, I don’t think you’ll ever see one appear on the market, the people tend to stay there. 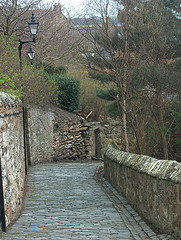 Now that I know a little more about Culross Village I feel that I have to go back there. It’s always better when you know some of the history surrounding a place.